Mondial Paris Motor Show, that’s the latest, modern name of the Paris motor show, now celebrating its 120th anniversary. As every year, more than a million visitors are expected from all over France. They may decide upon their new car from among the fifty or so manufacturers there. But how to choose? In the age of new anti-pollution standards, restricted use in cities and increasingly severe speed limits, manufacturers have to compete in ingenuity and seduction to win them over. We accompany both families and aficionados as they comb through the latest offerings in search of their next car. For exhibitors, the stakes are massive. What sales techniques do they use? Major manufacturers like the South-Korean Hyundai and a family business like the Bouhys and their electric Mokes, descendants of the mythic mini-moke, open their stands to us. 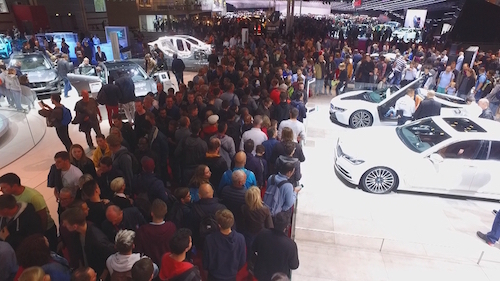 Between the dreams and the backstage reality, here’s the story of the great automobile adventure over ten crazy days at the Paris Porte de Versailles exhibition center.